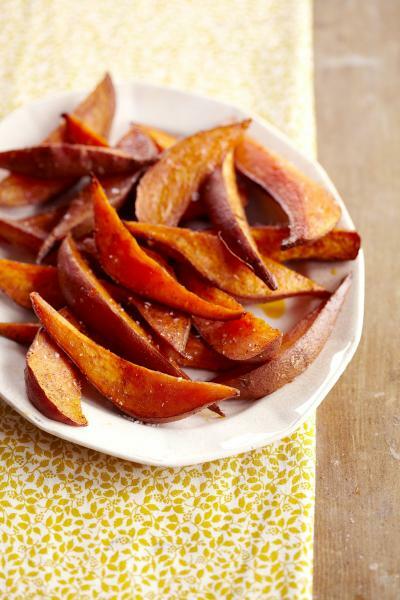 Baked Sweet Potato Fries - A & Z Pharmaceutical, Inc.
Preheat the oven to 425°F. Cut each sweet potato in half lengthwise, and place it flat side down on a cutting board. Cut the potato halves into 1-inch-wide wedges. In a small bowl, combine the oil, chili powder and 1 teaspoon of the salt. Place the potatoes on a roasting pan and brush with the oil mixture. Lay the potatoes flesh side down on the pan and put the pan in the oven. Cook until potatoes, turning once, until soft, 20 to 25 minutes. Remove the pan from the oven and season with remaining1/2 teaspoon salt. Let the wedges cool for a bit, and serve warm. Recipe courtesy of Parenting Magazine.